View cart “Canoeing Santa” has been added to your cart. 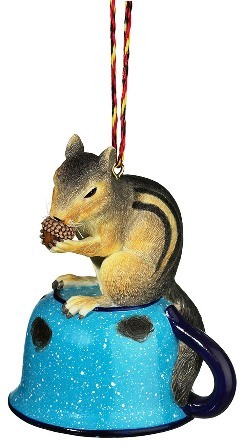 This adorable Chipmunk and Cup Ornament celebrates the softer side of life in the woods. Use the included hanging loop to give your holiday tree a dose of cute, playfulness. This ornament serves as a steady reminder of the simpler things in life. size: 3.4 x 2.8 x 2.2"